At what point did you decide to document your adventures by writing a book? I knew this experience had to be written down the moment I stepped foot onto my first Dniproavia plane! No amount of planning and travel guides could have prepared me for this experience. To sum it up: the cliché stranger than fiction … well, from one cliché to the next, truer words have never been spoken. I came home from my first trip on September 2, 2001. My entire world had changed and little did I know how the world would be changing for everyone just days later. It was such a surreal time. Back then, I was substitute teaching and would spend a lot of time writing ideas into my notebook. During the three days before Thanksgiving, I started scribbling out scenes for a “fictionalized” account of my Ukrainian experiences as a screenplay—originally entitled Jimmy & Katya. I can’t remember when I completed the first draft of the script; probably around a year or so later. In 2007, I optioned the script to a producer in L.A.—for one dollar! I never cashed the check. I wanted to save it. It was the first time I had been paid for my writing and I wanted to flaunt that check to everyone who ever doubted me. While it was under option, the script went through an extensive development process. Each subsequent draft turned my autobiographical screenplay into something that wasn’t remotely close to my real-life experience, which just happened to be the best experience of my life. It was becoming more and more Hollywood, paint-by-numbers, Meet the Parents-esque. Objectively, I agreed that the script was better. However, it was no longer my story. At one point, the producer actually suggested we set the story in Asia due to some potential funding sources! Ultimately, it didn’t matter. When it was all said and done, fifteen or so rewrites in, my producer dropped the project and my script was a free agent again. It was extremely discouraging, but it turned out to be a blessing in disguise. I then decided to turn the script into a memoir that would allow me to do two things: (1) stay true to the real-life events; and (2) include scenes that wouldn’t fit within the constraints of a screenplay. My overarching goal remains seeing Love & Vodka made into a movie someday, coming full circle through the back door. Love & Vodka is an extremely visual book. Was this a conscious goal in your writing? First and foremost, I’m a trained screenwriter. When I initially got the writing bug back in tenth grade, I gravitated immediately toward screenwriting and learned all the ropes about writing with a screenwriting hat on. So naturally, screenwriting lends itself to visual storytelling. Screenwriting also really teaches one the importance of brevity and conciseness—something I always lacked back in the days of writing term of papers. Ironically, the challenge in converting into a prose writer was learning how to write longer, more varied sentences and adding details that normally would be left out of screenwriting. 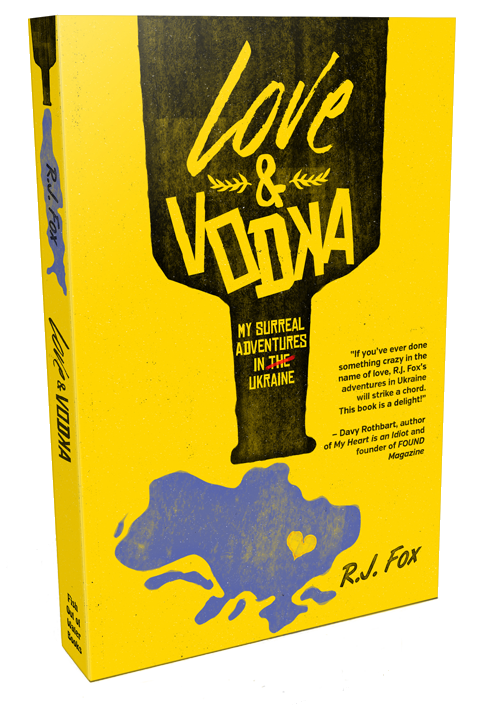 In “Love and Vodka,” the visual aspect was crucial because the setting is such an integral part of this book—–a main character unto itself. Which were your favorite chapters to write? Oh, so, so many! Don’t want to give away too many spoilers, but I think my personal favorite has to be the “Ukrainian Outhouse” chapter. Suffice to say, you haven’t really lived until a Ukrainian babushka woman is chasing after you with a bottle of bleach! I also really enjoyed writing “The Sobering Method.” You also haven’t really lived until a Ukrainian man is forcing your own fingers down your throat to make you vomit up the excess of vodka he inflicted upon you! Now that’s true friendship! With all the surreal, comic moments, it’s easy to lose track of the more dramatic, romantic moments that form the core of the story. That’s what makes this book unique from the typical travelogue. There’s this underlying romance guiding the fish-out-of-water aspect of the comedy There’s a whole raising-the-stakes angle in this that many travel memoirs lack. I could go on and on about favorite moments, but I don’t want to give too many spoilers. I want the reader to happen upon this experience as blindly unprepared as I did! Were your thoughts about what it might be like in Ukraine accurate? What surprised you most about your visits? At first, everything was a shock. But after a while, nothing really surprised me anymore. Based on the handful of guidebooks I had read, many of the things I experienced shouldn’t have been too much of a surprise. Yet, when they happen to you, it’s impossible to believe that it’s real life—especially your life. What did you learn from visiting Ukraine? How did the experience change you? My experiences in Ukraine changed my outlook in so many different ways. First off, it made me appreciate all the everyday comforts here that are so easy to take for granted. Things like the kindness of strangers, screens on windows, air conditioners, and refrigerated meat and dairy products. Let me just say that one thing I hope the book makes clear is that it is certainly not my intent to make fun of Ukrainian culture. I am making fun of myself in Ukrainian culture—the whole fish-out-of-water experience of a naive, “spoiled American” trying to figure things out. On a side note, I am still prodding CBS to make Survivor: Ukraine. Beyond the comic aspect, I hope my book reveals the true warmth and hospitality Ukrainians take such great pride in. The cuisine and the customs are really out of this world. I will never, ever forget the experience—the good, the bad, and the ugly. My life has been so much richer and more complete because of this experience. I was never the same person after my initial trip. It truly was life-changing. And I’m very grateful for that. What do you want readers to take away from reading Love & Vodka? It is my hope that anyone reading “Love & Vodka” who is sitting idly on a dream will be inspired to pursue it—to not be afraid to take a chance on something that many wouldn’t be willing to try. At the very least—and I can’t stress this enough—to find a way to take at least one trip in your lifetime that is out of your comfort zone. I realize this is easier said than done, but I never in a million years would have predicted that my life would lead me to such a zany adventure … yet it did. I’m glad nobody managed to talk me out of it. Some tried, but they failed! Having visited Ukraine, what are your feelings about the current conflict with Russia? The current situation in Ukraine is very sad. It’s interesting—and this perhaps sheds further light as to why traveling abroad is so important—had I never visited Ukraine, my interest in this topic wouldn’t have risen much beyond a general understanding of the headlines. However, being so ingrained in this culture, my awareness and interest level has certainly been heightened throughout this conflict. Of course, I am viewing events from a “safe” distance, but certainly with much more compassion that I would have otherwise. It is such a complicated issue because Ukraine itself was already so divided between western and eastern Ukraine. I pray for a peaceful resolution, but my gut tells me that such an outcome is such a long way off. Which authors or books have had a strong influence on you and your writing? David Sedaris was probably my greatest influence in the writing of this book. Obviously, he is known as a great humorist and memoirist. But I think what makes his humor stand out even more is the pathos and humanity he injects beneath the surface. I always love stories that have a bittersweet mixture. Somehow, this mix makes the funny stuff funnier and the sad stuff sadder. I hope my book manages this same effect at least on some level. Other contemporary influences are Davy Rothbart, Sloane Crosley, Bill Bryson, and Cheryl Strayed. The writer that first made me love the craft of storytelling was Stephen King, who I started reading in middle school. I haven’t stopped since. I’m a huge fan of J.D. Salinger. Catcher in the Rye is hands-down my favorite novel. Tell us a few weird and wacky facts about yourself! I have an unhealthy Sea-Monkey obsession! So much so, I used to show up to my fourth grade class with a Sea-Monkey necklace around my neck—a plastic bubble aquarium containing live Sea-Monkeys! I once got my arm stuck between two booths at a Dairy Queen and the staff had to disassemble the booths with a drill to free my arm. My mom once glued cotton balls onto my eyebrows for a school concert. When I attempted to remove the cotton balls, one of my eyebrows came off with it. I was once tied to a tree in the back yard of a bully and left there for several hours. This wasn’t nearly as bad as having my face shoved into a pile of dog excrement by a different bully. I credit moments such as these for helping me blossom into the writer I am today. I was such a goody-two shows growing up, my own father mockingly referred to me as “the righteous brother.” Yet, by the same token, I was once interrogated by the FBI for trespassing on an industrial island in Detroit. I once hid behind an apartment building in Los Angeles as men with assault rifles roamed the street. I once picked up legendary game-show host Chuck Woolery from the airport when I worked at an ad agency in metro Detroit. I am an excessive sleep talker and will write entire stories in my sleep. I once modeled for Bugle Boy.